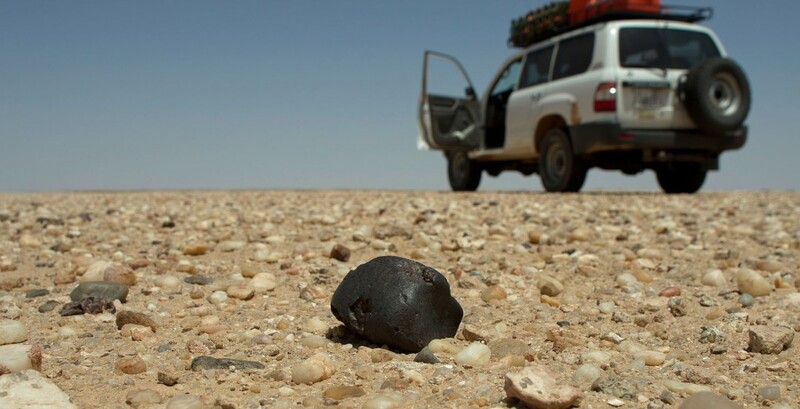 Meteorites that fell centuries or millennia ago today can be found in certain desert environments. These finds share some common characteristics and find circumstances worthwhile discussing. SHIELDING FROM WEATHERING, The most common find situation in hot deserts occurs on erosion and deflation surfaces where the accumulated soil, that contains the meteorites, is constantly eroded by the ever blowing wind. Meteorites found in these places usually represent millennia old fall events that occurred under climate conditions often less arid than today. 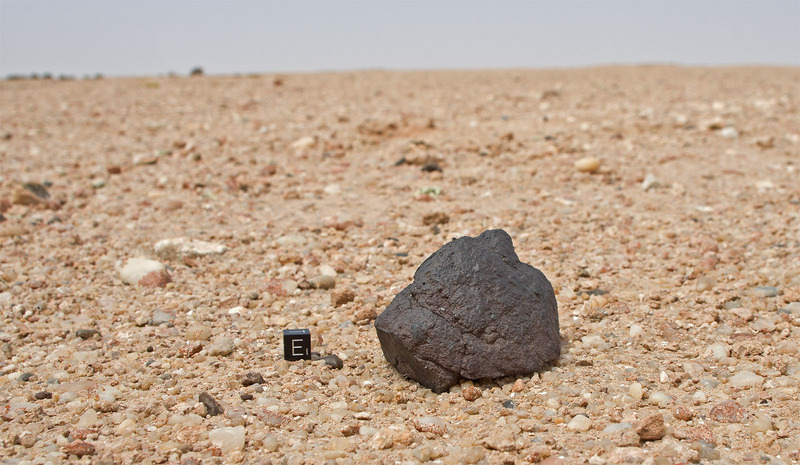 Meteorites that fell centuries or millennia ago today can be found in certain desert environments. These finds share some common characteristics and find circumstances worthwhile discussing. 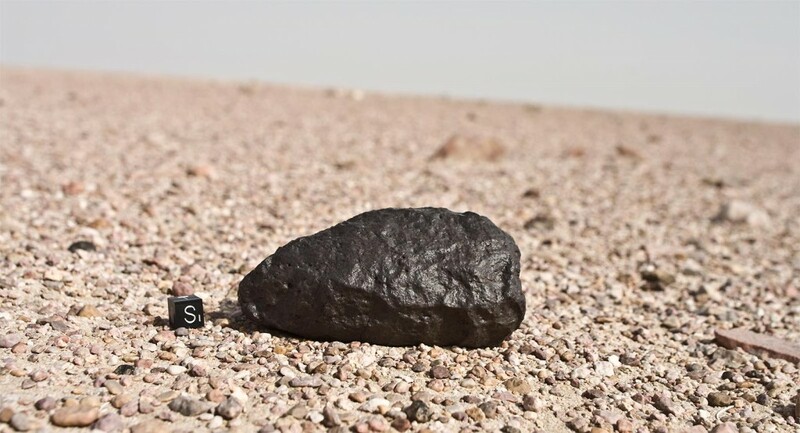 The most common find situation in hot deserts occurs on erosion and deflation surfaces where the accumulated soil, that contains the meteorites, is constantly eroded by the ever blowing wind. Meteorites found in these places usually represent millennia old fall events that occurred under climate conditions often less arid than today. These meteorites fell onto and were embedded in the soil at times when the respective soil surfaces used to be sedimentation or at least stagnant soil horizons, often shielded from wind and fluvial erosion by a protective cover of vegetation. Embedded in the soil they often withstood the destructive forces of weathering for thousands and sometimes ten thousands of years. After climate changes, which frequently occurred in geological times in the current African and Arabian deserts, deflation processes uncovered them and brought them to rest on today’s desert surface. Among these surface types the most advantageous for in situ preservation of meteorites once exposed, but also for spotting them, is the desert pavement (or desert mosaic). It is the final stage of a slow geological sorting process that continued for millennia. Deflation and wind erosion of the finer grained components of the top soil leaves only the coarser grained rocks to further abrasion, with the remaining rocks usually not bigger than 2 – 5 centimeters. If the original surface is composed of different grain sizes like for example silt, pea gravel and smaller rocks the eolian deflation will act selective. The fine grained material will be transported away first while the larger components remain and erode further. A soil horizon originating from such a sorting process sometime reaches a stagnant and almost inactive condition. The transformation almost comes to a halt. The smoothness of the face of the desert pavement provides hardly any contact surface even at high wind velocities. The remaining fine grained components are kept under and between the mosaic cover. All larger solid objects which came to rest in or on top of the original top soil horizon before or during the deflation process are found on top of the recent surface. This often includes prehistoric remains, human artifacts but also meteorites. Often these slowly emerging meteorites display rings or patches of a very hard light grey to ochre coating. This phenomenon is called caliche or calcrete. It consist of layers of a hardened calcium carbonate deposit that form where the above ground portion of the meteorite is in contact with the soil surface. Caliche forms through minerals leached from the upper layer of the soil and adhering to contacting surfaces. Caliche can also form on soils and meteorites when water rises through capillary action, for example into cracks and fissures, or when water is trapped on the surface of the meteorite and evaporates. Caliche formation is generally a very slow process, but if enough moisture is present in an otherwise arid site, it can accumulate quite fast, as everyone knows who ever inspected a blocked a drain pipe. Caliche on meteorites often contains other mineral constituents as well because the calcium carbonate tends to cement together other materials, including particles of sand, clay, and silt. 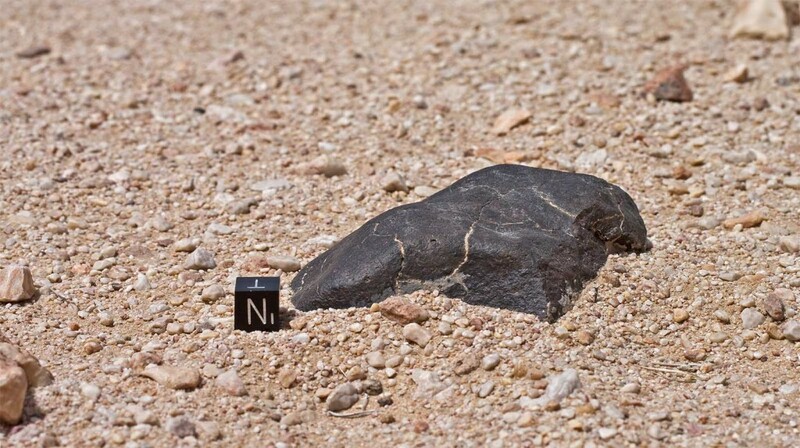 Caliche formation on a meteorite recovered from a desert surface can also provide evidence to reconstruct climate changes and connected geomorphological processes. Several parallel rings on a meteorite’s surface e.g. indicate abrupt changes in the soil erosion rate during the meteorite’s surface exposure time. Another common feature of finds originating from arid or hyper arid deserts is desert varnish (or desert patina). This is a thin shiny dark brown to black patina that forms over thousands of years and which is mainly composed of clay minerals. The latter comprise more than 70 percent of the varnish with silica being the most important mineral. Iron and manganese oxides make up the bulk of the remainder and are dispersed evenly throughout the clay layer. Because desert varnish contains varying amounts of microbes researchers were convinced that it is actually produced by bacteria oxidizing ambient manganese and iron from the windborne dust (Dorn et al. 1981). Recent findings however suggest that biological processes are not necessarily responsible for the varnish’s formation. According to these studies silica is dissolved from other minerals on desert surfaces and then gels together to form a glaze, usually trapping microorganic traces from its surroundings (Thiagarajan et. al. 2003, Perry et al. 2006).